I'm back from summer break and I want to add to your summer to-read stack. 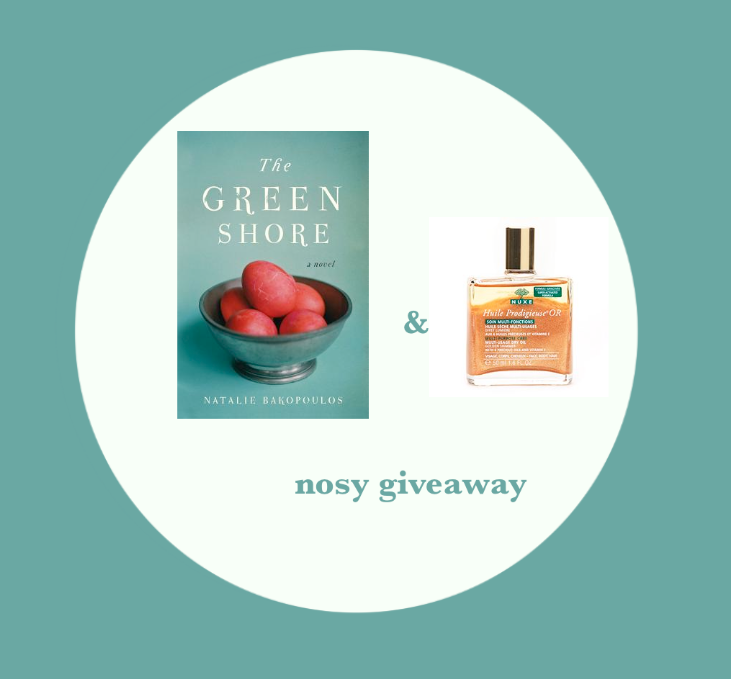 Natalie Bakopoulos's gorgeous debut novel, The Green Shore, was published in June and if you haven't already, you should read it straightaway. Let me make it easy for you by giving you a copy of the book along with a travel-size 10 ml bottle of one of Natalie's preferred fragrant beauty products, Nuxe Huile Prodigieuse (Multi-Usage Dry Oil), in the shimmery golden version so you can gleam up your limbs and pretend you're frolicking on a Greek island. Eleni laughed and wanted to respond to his comment about his son, but the moment seemed lost. Instead, she asked Andreas if he thought history had a smell, and he’d responded as if he’d just been thinking of it. “The earthy smell of archaeological excavation. And the exhaust-infused smell of rain,” he’d said. Eleni agreed, and added the industrial smell of the ceramics factory blocks from her house, where her children used to play and dig for dishes, stoneware, porcelain. To enter, please help spread the word that Nosy Girl is back by sharing the link to this giveaway on Facebook, Twitter, or your blog. If you do not use any of these platforms, you are a bit of a modern marvel. You can e-mail someone or tell them in person. Then, please leave a comment on this post letting me know how you shared the link (as with all nosy giveaways, the honor system reigns) and telling me one thing you smelled that day. I'll pick a winner (selected randomly from the comments) on August 16th. Thanks for spreading the nosy word, and good luck to all the great-book-and-beachy-smell seekers! Just found your blog via Arielle Weinberg! Great interview :) Shared the link via Twitter! Hope you get some traffic. Do you have a nosygirl twitter? I'd love to follow you! Rachel, I'm glad you found your way over & thanks for sharing the link! Twitter makes me a bit frantic, though I keep teetering on the edge, thinking of diving in...if I do, I'll definitely announce the plunge around these parts! Does history have a smell? How I love that idea? Sharing this great "novel" idea to get the word out about a book and also possibly get a free copy of The Green Shore by Natalie Bakopoulos. Nothing to lose and hopefully, a good read! Got a recommendation for a writer friend. shared this wonderful peice via facebook email and f 2 f :-) loved it!!! shared the link with my book club via e-mail. hope to win! Shared via Twitter. Sounds like a good summer read! Thanks to you all for sharing the link! I hope you new readers will stick around long enough to check out a few Nosy Interviews as well. Nosy Girl, I don't actually want to enter the giveaway (too absurd for you to post a French beauty product back to Europe), but I'm so very glad you're doing it (hope it's still not too late to post on FB, but I mostly wanted to publicise the book). Preeta made both the book and the beauty product sound so very wonderful - I'd love to find out for myself how right she is! My first time at your blog. I have shared on Twitter (@ranyamanivannan) about the giveaway. Awesome! Just shared it via Twitter @shonali_85.